What is Office 365 Backup & Restore? Office 365 Backup and Restore is one of the many cloud backup solutions offered by SysTools. 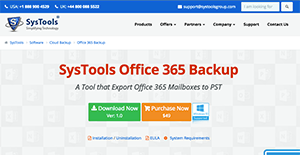 What Office 365 Backup and Restore does is backup your Office 365 mailboxes and export all information to Outlook PST or EML in your local machine. With Office 365 Backup and Restore, users can totally backup every detail stored in their Office 365 mailbox, including Emails, Contacts, and Calendar. Filtering information for backup is also available. Users can then filter information they want for Office 365 backup. Even with the tightest security measures, cloud storage still has some degree of risks that places critical and sensitive business information in a very vulnerable state. Office 365 and Backup ensures that all your information is secured in a local machine, safe from the probability of security breach, leaks, and unauthorized access. Office 365 account data can be locally backed up on the user machine. The backup promotes not only alternative data in case of disaster but also ensures its availability despite absence of network. The featured software is programmed to export Office 365 mailbox contents to PST & EML file types respectively. The backup output is generated and saved on local machine in the form of Outlook Data File (PST) or Individual Email file, as per the selection. All data is auto-mapped, stored and exported respectively in the output PST file. Therefore, the application promotes effortless and convenient backup generation of Cloud data on local machine. Backup generation is serviced for Single as well as multiple user accounts by the Office 365 Backup Software. The application exports Office 365 Mailbox to PST format in numbers with the help of impersonation feature enabled using administrator account for the backup of bulk mailboxes. Single Account backup exports a single PST file consisting of the respective account data. Multiple PST files are created at the selected destination path representing each account selected for backup. One can carry out a managed backup of Office 365 account(s) into Outlook PST or EML. The filter option enables the backup generation of selective data. The selection is based on specified time interval or selected folder. The option helps exporting only required Office 365 data or data that is extremely important to be backed up. In combination, another facility is provided for applying Naming Convention while saving and exporting in EML format for easily distinguishing files. What Problems Will Office 365 Backup & Restore Solve? Server outage or network unavailability results in inaccessibility of data stored on web servers. Backup generation is the best way to ensure business continuity in any and every scenario of disaster. The application additionally offers backup generation of selective as well as bulk user mailboxes. This guarantees the availability of all user mailboxes, just in case required. Office 365 Backup offers backup creation of hosted mailboxes on local machine in PST and EML file types respectively. Therefore, the backup is in a readable form via the supported applications. Enterprises have different wants and requirements and no software platform can be perfect in such a condition. It is useless to try to find an ideal off-the-shelf software product that fulfills all your business wants. The smart thing to do would be to customize the application for your unique needs, worker skill levels, budget, and other factors. For these reasons, do not hurry and subscribe to well-publicized popular applications. Though these may be widely used, they may not be the perfect fit for your particular requirements. Do your research, check out each short-listed system in detail, read a few Office 365 Backup & Restore reviews, contact the seller for clarifications, and finally select the application that offers what you want. How Much Does Office 365 Backup & Restore Cost? We realize that when you make a decision to buy IT Management Software it’s important not only to see how experts evaluate it in their reviews, but also to find out if the real people and companies that buy it are actually satisfied with the product. That’s why we’ve created our behavior-based Customer Satisfaction Algorithm™ that gathers customer reviews, comments and Office 365 Backup & Restore reviews across a wide range of social media sites. The data is then presented in an easy to digest form showing how many people had positive and negative experience with Office 365 Backup & Restore. With that information at hand you should be equipped to make an informed buying decision that you won’t regret. What are Office 365 Backup & Restore pricing details? What integrations are available for Office 365 Backup & Restore? Pros: Perfect Tool to take backup & restore data from office 365 to pst and other various format. I want to say thanks to SysTools to save my time. If you need more information about Office 365 Backup & Restore or you simply have a question let us know what you need and we’ll forward your request directly to the vendor.